The Hillstrom Museum of Art at Gustavus Adolphus College will present three new exhibitions beginning on Monday, Feb. 16. Imagined Worlds, Large and Small: the Photographs of Sarah Hobbs and Lori Nix, will be on view through April 19, concurrently with two additional exhibitions, In Memory of Richard L. Hillstrom, 1915-2014, and FOCUS IN/ON: Everett Shinn’s Magician with Shears. An opening reception will be held from 7 to 9 p.m. on Feb. 23, with gallery talks by artists Lori Nix and Sarah Hobbs beginning at 7:30 p.m. Please note that the opening reception, originally scheduled for Feb. 16, was postponed one week due to weather and travel issues with one of the artists. 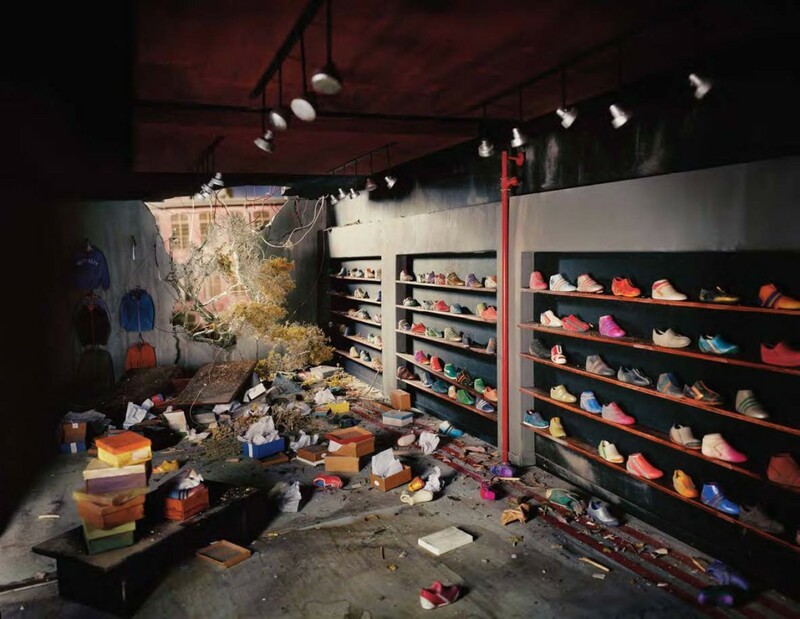 Imagined Worlds, Large and Small: the Photographs of Sarah Hobbs and Lori Nix features photography of created environments, with each artist working on a different scale. Lori Nix works in miniature, constructing detailed dioramas that are photographed and then disassembled. Sarah Hobbs creates life-size, site-specific installations and then photographs them. Both artists create images devoid of human figures that rely on the viewer’s engagement to complete the work. Hobbs’s photographs place the viewer in the position of the unseen individual whose neurotic tendencies are explored in the image. Her works are culled from several series, titled Small Problems in Living, Does This Sound Like You?, Emotional Management, and Overpacked. Nix’s apocalyptic works from her series The City invite the viewer to be a member of the unseen humanity and to contemplate what has led to its absence. Both artists’ works explore and blur boundaries between the real, the unreal, and the surreal, through staged interiors that serve as metaphors for our emotions, fears, and imaginings. Hobbs lives in Atlanta, Georgia, and her works are found in prominent collections such as the Art Institute of Chicago, the Los Angeles County Museum of Art, and the Brooklyn Museum of Art. Nix lives in Brooklyn, New York, and her works are in important collections such as the Smithsonian American Art Museum in Washington, D.C., the George Eastman House in Rochester, New York, and the Museum of Fine Arts, Houston. Imagined Worlds, Large and Small was organized by the Hillstrom Museum of Art in collaboration with Gustavus Associate Professor of Art and Art History Priscilla Briggs, who teaches photography and video classes at the College. Hobbs will visit campus to work with students in Briggs’s Digital Photography II class to create an installation and then photograph it, an activity supported with funds from the College’s Ethel and Edgar Johnson Fund for the Arts. The gallery talks in the exhibition by both Hobbs and Nix are presented with support from The Gustavus Artist Series. In Memory of Richard L. Hillstrom, 1915-2014 is a focused exhibit presented as a memorial to the Reverend Richard L. Hillstrom, namesake of the Hillstrom Museum of Art and a 1938 graduate of Gustavus. A paragon of generosity, support, and friendship, Hillstrom died December 16, 2014 at the age of 99. The two oil paintings on view, Dunes (1894), by Homer Dodge Martin (1836-1897), and Breaker (c. 1930s or 1940s), by Harry D. Froot (1892-1952), are the final artworks to come to the Museum from Hillstrom’s collection. The total number of works given by Hillstrom to the Museum is around 250, and these were the last two artworks he had in his apartment, favorites kept until his final day. FOCUS IN/ON: Everett Shinn’s Magician with Shears is another of the Museum’s FOCUS IN/ON projects, in which a single work from the Hillstrom Collection is analyzed in depth, in collaboration with a colleague from across the Gustavus curriculum. An oil painting titled Magician with Shears by American Ashcan painter Everett Shinn (1876-1953) is the subject of an exhibition and essay co-written by Micah J. Maatman, Associate Professor and Chair of the Department of Theatre and Dance, and Hillstrom Museum of Art Director Donald Myers, which considers the artist, his career, and his strong interest in theatre, in particular vaudeville, through the painting, and will also reconsider the painting’s likely date and suggest the identity of the particular magician depicted by Shinn. As with all programs of the Hillstrom Museum of Art, these exhibitions are free of charge and are open to the public. All three of the exhibits are accompanied by an illustrated brochure that is available free of charge. Regular hours for the Museum are weekdays, 9 a.m. to 4 p.m., and weekends, 1 to 5 p.m. For more information, please visit the Hillstrom Museum of Art’s website.